Pall bearers carry the casket of Scott Beigel after his funeral in Boca Raton, Florida, Feb. 18, 2018. Students who escaped the deadly school shooting in Florida focused their anger Sunday at President Donald Trump, contending that his response to the attack has been needlessly divisive. "You're the president. You're supposed to bring this nation together, not divide us," said David Hogg, a 17-year-old student at Marjory Stoneman Douglas High School in South Florida, speaking on NBC's "Meet the Press." "How dare you," he added. ​Trump was at his Florida estate Sunday but did not mention the attack in a series of tweets. After more than a day of criticism from the students, the White House said the president would hold a "listening session" with unspecified students on Wednesday and meet with state and local security officials Thursday. Florida politicians, meanwhile, scrambled to produce legislation in response to the Feb. 14 attack that killed 17 people. Nikolas Cruz, a 19-year-old who had been expelled from the school, is being held without bail in the Broward County Jail, accused of 17 counts of first-degree murder. Emma Gonzalez, another student who survived the attack, cited Trump, Rubio and Scott by name in a warning to politicians who are supported by the National Rifle Association. Marjory Stoneman Douglas High School student Emma Gonzalez reacts during her speech at a rally for gun control at the U.S. Courthouse in Fort Lauderdale, Fla., Feb. 17, 2018. The students have vowed to become the face of a movement for tighter firearm regulations and plan to visit the state capitol in Tallahassee this week to demand immediate action. They are also calling for anti-gun violence demonstrations in Washington and other cities March 24. Organizers behind the Women's March, an anti-Trump and female empowerment protest, called for a 17-minute, nationwide walkout by teachers and students on March 14. The Network for Public Education, an advocacy organization for public schools, announced a day of walkouts, sit-ins and other events on school campuses April 20, the anniversary of the 1999 shooting at Columbine High School in Colorado that left 12 students and one teacher dead. Not every student at the Florida school was calling for more gun control. James Ciaramello, a freshman in the school's JROTC program, on Friday paused at a memorial in a park in front of a photo of one victim, 15-year-old Peter Wang, another JROTC student who was killed after holding open a door so others could escape. "He's just messed up," Ciaramello said of Cruz, who was also in JROTC. "I mean, tighter gun control, it's not gonna help. There's always a way around it." School and government records obtained Sunday show Cruz was diagnosed as developmentally delayed at age 3 and had disciplinary issues dating to middle school. In February 2014, while in 8th grade, Cruz was transferred to a special school for children with emotional and behavioral issues. He stayed there until 10th grade, when he was transferred to Stoneman Douglas. A month after arriving, Cruz was written up for using profanity. Last year, Cruz was expelled. 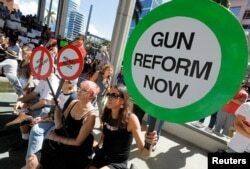 Protesters hold signs as they call for a reform of gun laws three days after the shooting at Marjory Stoneman Douglas High School, at a rally in Fort Lauderdale, Florida, Feb. 17, 2018. On Sept. 28, 2016, an investigator from the Florida Department of Children and Families visited Cruz and his mother, Lynda Cruz, after he posted video on Snapchat showing him cutting himself. The report showed that Cruz had written a racial epithet against African-Americans and a Nazi symbol on his book bag, which his mother had forced him to erase. The investigator said Cruz was suffering from depression and on medication and had told Lynda Cruz he planned to buy a gun, but she couldn't determine why. A crisis counselor told the DCF investigator he had visited the school and that he did not believe Cruz was a danger to himself or others. The case was closed, with the investigator concluding that Cruz was receiving help from his mother and counselors, and "no other referrals or services were needed." After Lynda Cruz died in November, Cruz moved into the home of a teenage friend. The friend's parents told the Sun-Sentinel newspaper they had no idea the extent of Cruz's issues. "We had this monster living under our roof and we didn't know," Kimberly Snead told the newspaper in an interview published Sunday. "We didn't see this side of him." James Snead added: "Everything everybody seems to know, we didn't know. It's as simple as that." The Sneads said Cruz seemed unable to do even simple tasks like laundry or use the microwave. He kept the AR-15 he allegedly used in the massacre locked in a gun safe with a few other firearms. James Snead thought he had the only key to the cabinet but says Cruz must have had another key. The family kept their own rifles, bought after a burglary a few years ago, in a separate locked cabinet. On Wednesday morning, Cruz told them he didn't need a ride to school: "It's Valentine's Day and I don't go to school on Valentine's Day," he said. Later he texted he had "something important" he wanted to tell the teen. Then he wrote: "Nothing man."